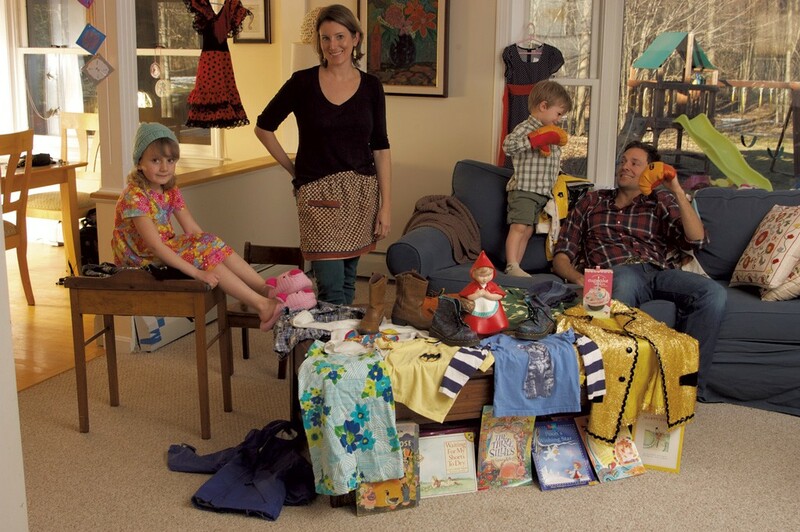 Less Is More | Editor's Note | Kids VT - small people, big ideas! From my artsy and unconventional mom, my two sisters and I all inherited a deep love of thrift-store shopping. There's something mysterious and romantic about walking into a Goodwill or consignment shop and methodically sifting through the merchandise in search of some abandoned treasure. I also find great satisfaction in getting a deal. But that means I sometimes make purchases — especially for my kids — that we don't really need. That deluxe Barbie Dreamhouse for $20 that I couldn't pass up? Mira and Theo played with it for 20 minutes before they lost interest. Mira's flowery cowboy boots? They were stylish but not the most practical choice of footwear. And the scores of used picture books I've bought at garage and library sales? Our bookshelves are groaning under the weight of them. Most of my impulse buys end up cluttering up my life. So, a couple of times a year, I reach a breaking point and do a major house purge. That's one of the reasons I was so impressed by Erin Morrison and Matt Cutts. They live with their 2-year-old daughter and dog in a tiny house — a 200-square-foot dwelling just south of Middlebury. I interviewed the couple for "Living Small." Every square foot matters in such a little space, so they've had to be more thoughtful about the items they bring into their home. By sheer necessity, they've eschewed the cycle of purchasing and purging American families like mine know all too well. Not sure I'm ready for that kind of extreme downsizing, but my visit with them put a temporary hiatus on my thrifting excursions. Another cool, diminutive space in this issue: the Harry Potter-themed vehicle that belongs to the Clark family of Underhill ("Habitat"). In 2015, dad Kyle bought a retired school bus and, with the help of family and friends, converted it into a magical RV so his family of six could take cross-country adventures. The release of our August issue means that the countdown to the first day of school has officially begun. There's still time to savor the season, though, and this issue will help you do just that. Head to Sugarbush Resort to enjoy the alpine air, zip line and bungee trampoline ("Destination Recreation"); stay overnight in the Adirondacks ("The Weekender"); check out an upscale picnic-themed restaurant in Stowe ("Out to Eat"); or just browse the calendar and find some family fun. After all, Barbie Dreamhouses and cowboy boots may provide fleeting pleasure, but those sweet summer memories will stick around forever.